We have obtained a large number copies of this most beautiful gift edition of Bunyan’s The Pilgrim’s Progress published anywhere at this time: a truly historical reprint. This is a high-quality, large (10″ x 7″) cloth cover, with Smyth sewn binding. The cloth cover is a beautiful work of art. Inside, the volume contains 171 well-crafted illustrations from an original 1891 edition. Share with your family the greatest allegory of the Christian life ever written. 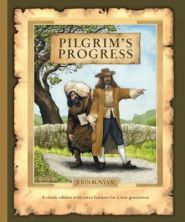 This volume also includes Christiana’s Story, called by Bunyan “Part, the Second”, additional material which is frequently left out of other editions of The Pilgrim’s Progress). 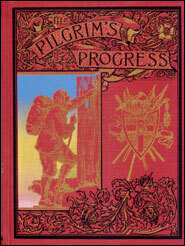 We have obtained a large number of copies of this beautiful gift edition of John Bunyan’s The Pilgrim’s Progress. We know of none published anywhere at this time which equal this truly historical reprint. This is a high-quality, large (10″ x 7″) cloth cover, with Smyth sewn binding. The cloth cover is a beautiful work of art. Inside, the volume contains 171 well-crafted illustrations from an original 1891 edition. Share with your family the greatest allegory of the Christian life ever written! 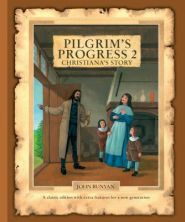 This volume also includes Christiana’s Story, called by Bunyan “Part, the Second.” This valuable section is Bunyan’s additional work, frequently left out of other editions of The Pilgrim’s Progress. John Bunyan certainly authored the most influential book in the English language (other than the King James Bible). But The Pilgrim’s Progress is so much more than that. It was written in two parts. The 1st (and most famous) part involves Pilgrim leaving his wife and children and risking everything to get to the heavenly city. contained in this volume, tells the story of how Pilgrim’s wife and children follow in his footsteps to The Celestial City. Bunyan wants his reader to travel through this book as an adventure through the Christian life. He masterfully retells this in picturesque words. Though not as well-known as The Pilgrim’s Progress, this sequel has an equal place in the hearts of those that know of it. 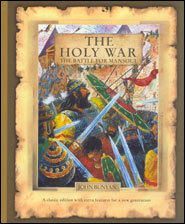 If you’ve read The Pilgrim’s Progress but not Christiana’s story yet, then get ready to enjoy a new set of challenges to overcome as Christian’s wife and children make their way to the heavenly city. Yet again Bunyan’s imaginative text brings out practical and necessary lessons that every believer learns in his walk with God.